So when I started this, I could not remember for the life of me what happened in the first book Red Queen .... oops. So I will admit that it was a bit hard to get into this one which was really frustrating because I quite liked the first one. I think it was about 150ish pages in that I really started getting back into it. I certainly got more invested in the story as I remembered things. Mare was A bit annoying at times, some of the choices she made were not always the best and she can become a bit whiny. I love Cal, there is just something about his character that makes me swoon haha, though there was one point where I was like seriously Cal why would you not comfort Mare after Shade's death, she needed you! There were definitely some intense scenes thrown in there that had me on the edge of my seat. I was honestly quite shocked that Shade died, he got brought back at the end of Red Queen only to be killed. That just seemed so unfair! There is this one line on the end of page 250 "If I am a sword, I am a sword made of glass, and I feel myself beginning to shatter" I just love the sound of that and I have a feeling that this line inspired the title of the book. After finish Glass Sword I can still say I really hate Maven with a passion, he is so awful I can't stand him but I guess thats what makes him the perfect villain, he is truly evil even though he "tries" to hide it from his people. One thing that is constantly brought up is Mare's lack of trust, it frustrated me a bit because not everyone is out to get her honestly I felt she need to grow up at times and pull on her big girl pants. Another Character that I started to love was Shade, he was not in the first book very much and we get to see a lot more of him in this book which was awesome. I do hope in the next book we will get to see more of Mare's other brothers. Also the way this ended makes me wonder what the fate Mare will have. Having her chained like a dog my goodness I wanted to punch Maven right in the face. Hard. 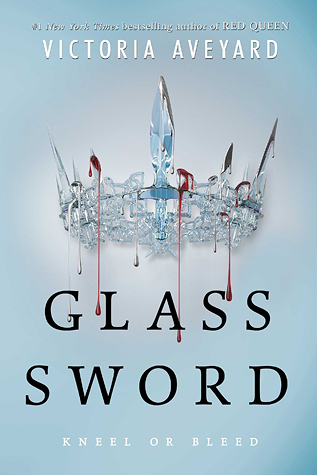 I will definitely be re-reading Red Queen and Glass Sword again before the release of the 3rd book in Feb next year.